Hot off the press, here is the brochure for the 6th Annual Hotel & Lodging Legal Summit at Georgetown University Law Center. It is my privilege to co-chair this conference. In addition to 7 General Counsels, 4 Chief Financial Officers and 2 CEOs from the hotel and lodging industry, this year’s agenda features a keynote speech by U.S. 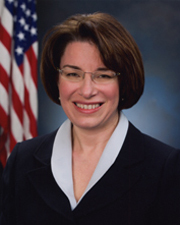 Senator Amy Klobuchar (D-MN), a Co-Chair of the Senate Travel & Tourism Caucus. Senator Klobuchar hails from my home state of Minnesota. She has earned a lot of respect here in Washington and has recently made weekend trips down I-35 to Iowa, fueling speculation that she may run for President in 2020. Senator Klobuchar has also built a reputation in the travel industry as a strong supporter of tourism in the United States. Meanwhile, she has supported efforts within the hotel and lodging industry to fight human trafficking activities in hotels, including as an author of the Justice for Victims of Trafficking Act of 2015. THANK YOU to Senator Klobuchar and her staff for supporting our conference, and to my client Minnesota-based Carlson Rezidor Hotel Group and my high school classmate Ramsey County District Attorney John Choi for helping me bring the conference to the Senator’s attention.